Laser CNC Router processing is based on the use of numerical control technology, laser as the processing medium. The physical degeneration of the melting and gasification of the processed materials under laser irradiation is achieved. Laser processing features: no contact with the surface of the material, not affected by mechanical movement, the surface will not be deformed, generally do not need to be fixed. Not affected by the elasticity and flexibility of the material, easy to soft materials. Machining accuracy, high speed, wide range of applications. Common way 1, divided into laser cutting, laser engraving, laser marking, glass (crystal), such as several kinds of.2, the process is through the laser engraving machine, laser marking machine, laser cutting machine and other equipment to achieve. Applicable materials: non metallic materials processing (CO2 laser); organic glass, wood, leather, cloth, plastic, printing rubber, double color plate, glass, synthetic crystal, horn, cardboard, density board, marble, jade and other. Application areas: advertising logo card, printing and packaging, leather clothing, model making, craft gifts, hot plate, furniture fabric, toys, crystal ornaments, decoration, carving, electronic panels. 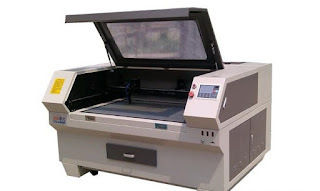 Laser CNC Router using non contact processing, the material will not cause mechanical extrusion or mechanical stress. There is no "marks", do not harm the surface of the parts processing; does not make the material deformation; accurate, fast processing, one machine multi-purpose, safe and reliable. Common single head laser CNC Router and double head laser CNC Router.